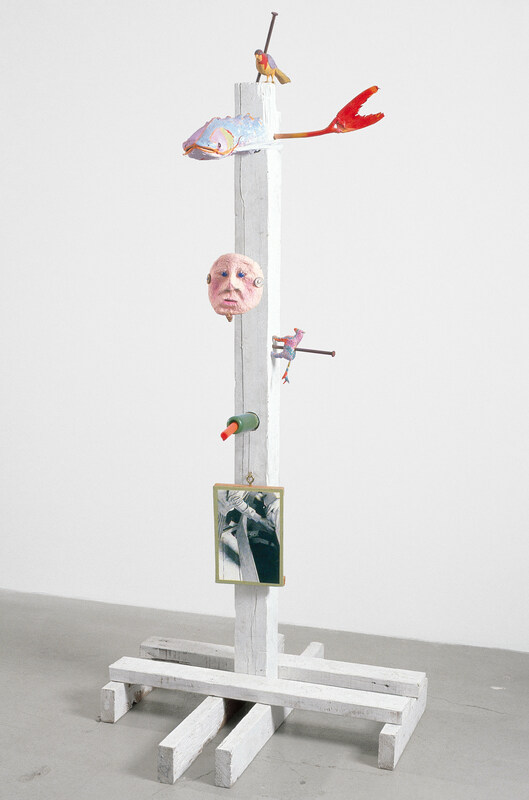 For Coyote/Trickster, Jimmie Durham employs animism, organic materials, and iconography. Representing a trickster figure in many cultures, the coyote is a recurring image for the artist, who has himself been called a trickster for the humor and wit he deploys in his work. While Durham's long-standing use of materials like stone, wood, animal skulls, and leather is in part a playful push against what is expected of him as a Native artist, he in fact has enormous respect for these objects' past lives. Much of his sculptural practice stems from his desire to give materials new purpose and to expand their associative meanings in new directions. "Coyote/Trickster." Take It or Leave It: Institution, Image, Ideology Digital Archive. Los Angeles: Hammer Museum, 2017. https://​hammer.ucla.edu/​take-it-or-leave-it/​art/​coyotetrickster/​.